If you have been following my work for a while you would know at least two things. 1. I love Mana Pools in Zimbabwe. 2. I love showing the bigger picture in my wildlife photos. 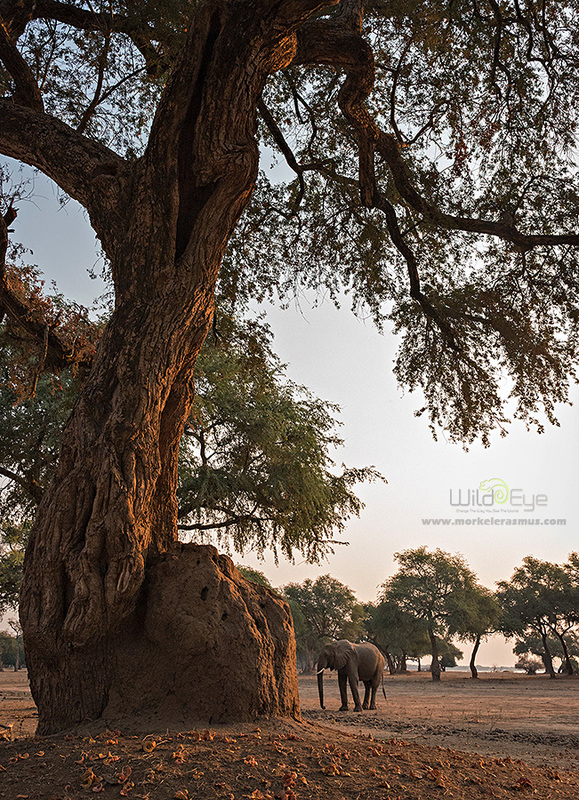 Well, I want to show you a photo taken IN Mana Pools showing the BIG picture. It's an elephant photo, but it's not really in principle just about an elephant - got it? I captured this photo alongside my guests as I hosted a Wild Eye photographic safari in conjunction with Mwinilunga Safaris in Mana Pools. You see, as I explained in this post, my fascination with Mana Pools goes far deeper than just the wonderful experiences that can be had walking with the elephants, lions, wild dogs etc. It's also the ethereal beauty of these floodplain-forests and the immense and gnawed Faidherbia Albida (Winterthorn) trees that dot the landscape that has me in awe. It's not primarily about the elephant. It's about the tree(s), the mood and the moment my guests and I experienced. I'd like to think I achieved that. Drop me a comment, tell me what this photo does for you!